THE NEWS dominating the FFR show floor this year was unquestionably the move toward felt-free soles. The attention given aquatic nuisance species (ANS) by national and state wildlife agencies, biologists, and Trout Unlimited and other conservation groups tipped the balance for designers. In 2009 there are at least four companies planning “sticky rubber” soles for their wading boots and shoes, and there is a strong possibility that felt soles will be virtually gone from the marketplace in a couple of years. Simms took the bull by the horns this fall and announced that 2009 will be the last year in which they include felt soles in their line-up. To that end, they are on the verge of releasing their first custom Vibram soles — called theSimms StreamTread™ — on eight different footwear models, including the G4 Guide Boot, Rivershed Boot, and Freestone Boot. Prototypes for the new soles were on display at the FFR show in Denver, and Simms says the new soles will be available by early January 2009 at the latest. The 360-degree lug design offers a “15-20 per cent improvement” over current rubber sole technology. More innovation is happening in Simms’s wader line, where they will introduce new Headwaters Stockingfoot Waders ($299.95) in men’s and women’s styles. We were particularly excited that Simms will take the design features of the Headwaters line and apply them to a new Pant wader ($249.95). We think there is a growing need for waders that appeal to those looking for convenience and moderate price, and who don’t want the bulk of roll-down wader tops. For 2009 Simms is also introducing new Freestone Zippered ($200.95) and unzippered ($199.95) Stockingfoots, and even a new wader for kids, the Kid’s GORE-TEX™ Stockingfoots. The Patagonia lineup for 2009 is one of the most impressive in years — not because the company did anything overly dramatic in wader product redesign, but because they continue to implement changes that are clear steps forward in utility and style. 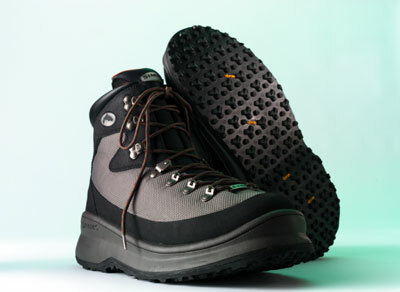 A great example is the addition of patent-pending merino wool liners in the booties of their top-of-the-line Guidewater Waders ($425), which also sport non-corrosive thermoplastic urethane (TPU) suspender connections, a waist-mounted suspender (for those who don’t like zippers), and new gravel guards that are lighter and drain water better. The merino liners allowed Patagonia to reduce the thickness of the booty neoprene while increasing warmth. For the price, it’s hard to find such feature-filled waders, and for that reason — and the comfy new booties — the Guidewaters get our MidCurrent Best of Show nod. Also new for spring 2009 are Patagonia’s Watermaster Hip Highs, which incorporate quick-release buckle hip adjustments instead of suspenders or belt loops. Field testers say these new waders are going to be very popular for backcountry treks and float trips, where comfort is a huge factor — not to mention the fact that they will cost only $180. The company will also carry forward the improved waist-mounted suspender system and TPU connections into their full-sized ’09 Watermasters. In the footwear category, the new Izaak wading sandal ($90) features super-sticky Vibram “Idrogrip” soles and synthetic uppers with a full toe guard, and the new Tideswing ($100) is a lightweight, breathable water shoe with both deep lugs and razor siping, meant to function as well on a skiff deck as when wet wading or surf fishing. At FFR, L.L. Bean was talking up some revolutionary new construction techniques for waders due out in mid-spring, but the details are still secret. Suffice to say that they think they can improve wader comfort and durability significantly with new fabric cuts. For 2009 Chota‘s got a new PU-coated leather wading boot with sticky rubber soles called the RockLoc that replaces their Brookie 2 boots and will sell for $139. Besides answering the demand for enviro-friendly soles, the new boots work great for hike-in fishing. They’ll be available December 1, 2008. Korkers is offering a brand new Kling-On™ High Friction sticky rubber sole as part of their interchangeable sole systems. Available on March 15, 2009, the new soles ($29.95, $39.95 studded) use a proprietary closed cell material and fit all wading boots and shoes that use the Omnitrax system. Korkers also showed us a clever new Torrent shoe and sock combo ($114.99) that features a perforated 1mm neoprene sock with an adjustable strap at the top to lock out grit. Last but not least, their new fixed-felt-sole Predator wading boot ($149.99) is only the second wading boot in their line with the innovative Boa Lacing system. If you haven’t seen the Boa system, you should check it out; it makes laces seem antiquated, and it also has us wondering if this is not the direction other manufacturers will take as they improve wading gear’s resistance to transporting biological contaminants. The coolest item we saw in Orvis‘s 2009 wader lineup was their new Pack & Travel Sonic Seam waders ($229). The patent-pending seam construction eliminates thread (and therefore needle holes and wear lines). And the full-size waders pack into a 6″ x 11″ x 4.5″ stuff sack. Orvis is also updating their Silver Label stockingfoot waders with the Silver Label III ($249), which features a slimmer cut and two layers of four-layer fabric in the lower leg for increased wear resistance. Their new Clearwater Endura stockingfoot ($149) also uses the less-bulky cut and features back-of-the-leg seems for durability. Orvis also has a new felt-soled Wet Wading Sandal ($119) with a shock-cord-style lacing system and padded footbed. Meanwhile Redington’s new CPX Zip-Front and standard waders utilize their proprietary Redstorm waterproof breathable fabric in new designs for 2009. The Zip-Front wader features a big Riri brand front zipper that in our minds recognizes the fact that tiny zipper tabs are impractical, especially in cold weather. The Zip-Fronts also feature stretch front pockets and oversized handwarmer pockets and range in price from $279 to $299, depending on size. The non-zippered versions retail for $199-219. Not quite a “wading shoe” but certain not a hiking boot, the new Reef Runner ($110.00) from ExOfficio might be just what the doctor ordered for those who want plenty of protection, support and grippiness in low-profile footwear. It features a waterproof leather upper, removable 4×4 support footbed and an EVA midsole with wet traction siped rubber outsole. Cloudveil is offering a new Hellroaring Wading Pant ($250) with 5-layer fabric in the lower leg and 4-layer 2-way-stretch fabric throughout the rest of the wader. The new pant uses a proprietary waterproof fabric. They are also adding the sticky Vibram “IdroGrip” rubber sole to their new 8x Grippy Rubber Boot, which will be available in February ’09.